Bed Of Roses - Get lost in the breathtaking scent of fresh cut roses. If you are looking for a true rose scent, this is it! Coconut Lime - Irresistible scent of zesty lime and creamy coconut. Cool Basil Citrus - A sweeping blend of fresh basil, orange, Italian bergamot, and lemons; followed by damascenia rose, clove bud, and ylang ylang; with a base of woody musk. Eucalyptus Spearmint - Refreshing eucalyptus & fresh mint melts stress away. Fresh Cut Lilacs - A rich fragrant welcoming start of spring. From the Vineyard - Bright citrus bergamot intermingled with fruity apricot and a pulpy grape complex, followed with a soft vanilla base. This fragrance is based on a blend of the aroma & taste of Chardonnay & Merlot wine. Green Earth - Rich woody notes of musky oakmoss with an enchanting fusion of herbs and amber. Honeysuckle - Warm sweet scented nectar of this delicate bell shaped spring flower. Hope - The heavenly combination of jasmine & gardenia. Hyacinth - These highly fragrant, bell-shaped flowers brighten everyone’s March signaling that Spring is on the way! Magnolia Blossom - The exotic aroma from the blooming petals of a magnolia tree. Manasquan Inlet - A refreshing ozoney aroma with hints of lily of the valley, fresh hyacinth, with a top note of wisteria. Strawberry Shortcake - Buttery vanilla cake with ripe, sliced strawberries, topped with sweet whipped cream. Tulip - Nothing compares to the fresh and clean scent of a field full of tulips that bloom in the spring. It is very important to keep your candle wicks trimmed. Untrimmed wicks will cause larger flames and that will create soot. You're burning soy candles to avoid soot, so don't go causing it yourself by not keeping those wicks trimmed!! 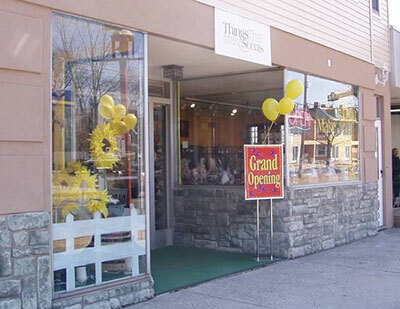 8 Years ago today the Things That Make Scents retail store opened its doors for the first time. It’s weird how sometimes it feels like yesterday and sometimes it feels like a life time ago, and that calls for a celebration!! Please join us this Saturday March 7th 10am – 4pm for customer appreciation day as we celebrate our 8th anniversary! Save 30% off your purchase, 10% off consignment merchandise, enter to win a $100 gift certificate, and enjoy an abundance of delicious snacks & refreshments all day long!